Providing hospitality since 1816 and celebrating its bicentennial this year with newly renovated rooms, Congress Hall in Cape May is a haven of relaxed elegance, fun, historic charm and luxury at the New Jersey shore. 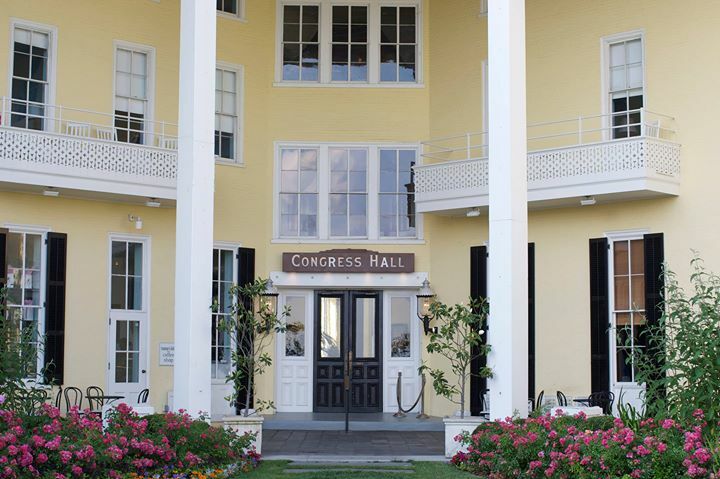 Set amid landscaped grounds overlooking Cape May's broad sandy beaches, the iconic Congress Hall is just a few steps from the ocean in the heart of Cape May's famed historic district. For the ultimate beach day, guests can relax by the Atlantic in a signature yellow and white striped Congress Hall private beach tent or lounge by the pool, both experiences offer food and beverage service. Guests can dine at The Blue Pig Tavern, the hotel's signature restaurant that features farm-to-table menu items from Cape Resorts' very own 62-acre Beach Plum Farm located 1 mile from the hotel. Additionally, Congress Hall guests, Cape May visitors and residents can experience the luxurious, accessible and relaxing Sea Spa. Acknowledged by Condè Nast Traveler as one of the top 75 Hotel Spas in the United States, the Sea Spa interior is designed to look like the inside of a beach tent to further enhance the feeling of a seaside getaway. During the summer season, guests can also enjoy beachside spa services. Congress Hall was additionally honored by Condè Nast Traveler as one of the top US hotels in the Northeast, made their list of the Top 10 Hotels in the Mid-Atlantic, and was most recently awarded the #2 spot on Condè Nast Traveler's 2015 Reader's Choice Awards Top 20 Hotels in the Mid-Atlantic and New York. The property offers a wide variety of entertainment including the Boiler Room, a live entertainment lounge offering wood fire pizza, a fun atmosphere with a New York downtown nightclub vibe, and the Brown Room, a sophisticated lounge where hotel guests and locals mix and mingle while enjoying cocktails and delicious appetizers which also highlight ingredients from Beach Plum Farm. Congress Hall is located at 200 Congress Place, Cape May, NJ 08204.